The Ultraviolet ~ UV Index app for iPhone and iPod Touch is a straightforward app that indicates the UV index rating for any location around the world. This is a great app for those that are skin-care conscious and want to monitor their UV sun exposure. All one has to do is choose a location and the current UV index rating for that location will appear with instructions on how much skin care protect is needed. To pick a location, the user can either use the arrow icon at the top right corner of the map to instantly find their location. Or, the user can use their finger to move the map to any point in the world. Just align the crosshairs circle in the center of the screen to find the rating of your desired location. The name of the location will appear under the ‘Choose Location’ to ensure the correct location has been chosen. The UV index rating appears in the upper part of your screen, below the location for which it is reading. The index rating appears large in the orb’s center, with an advanced warning of tomorrow’s UV rating underneath. 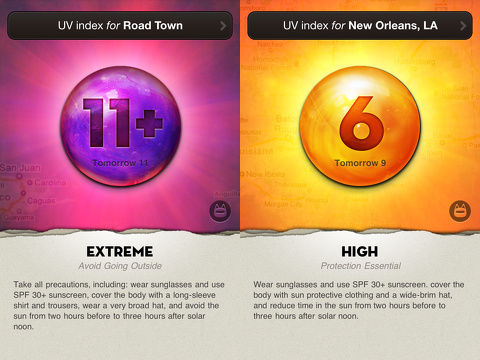 What’s great about this app is that it doesn’t assume the user already knows the level of severity of the UV rating. Below the rating, is an explanation of the level of UV (low to very high) with an indication of how much protection you need (from none to essential). The app further goes into explanation by giving suggestions on how to protect oneself from the UV level, right down to the adequate level of SPF protection. 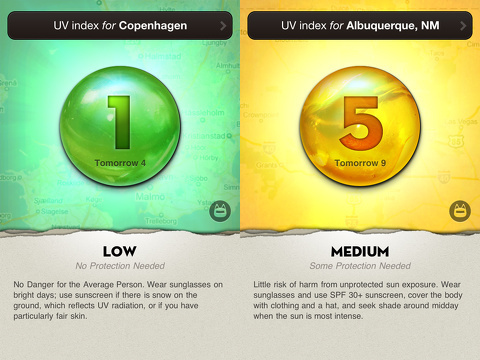 The app has only two screens: the UV index rating and a map to choose a location. The graphics for this app are great. The map screen is reminiscent of old-fashioned maps with its muted colors and dark wood top screen banner. The map screen is just like using Google Maps, so the more it is zoomed in, the more detail one can see. The UV index rating screen shows the rating in a sun-like, metallic orb that changes color for each rating. Cooler green and blue colors indicate lower ratings and reds and oranges indicate higher ones. The higher the rating,the more sun-like the orb gets with what look likes rays of bright yellowish light surrounding the orb. This is all set to a faint backdrop of the map location for which you have selected. It is important to note, that when checked against various reputable weather websites, the UV index rating was almost always accurate. At no cost, the Ultraviolet ~ UV Index from Robocat is essential for anyone concerned with sun protection. AppSafari review of Ultraviolet ~ UV Index was written by Sally Pope on July 31st, 2012 and categorized under App Store, Weather. Page viewed 5710 times, 2 so far today. Need help on using these apps? Please read the Help Page.